EDINBURGH, Scotland (AP) — For Scots, Wednesday was a day of excitement, apprehension, and a flood of final appeals before a big decision. In a matter of hours, they will determine whether Scotland leaves the United Kingdom and becomes an independent state. A full 97 percent of those eligible have registered to vote — including, for the first time, 16- and 17-year-olds — in a referendum that polls suggest is too close to call. A phone poll of 1,373 people by Ipsos MORI, released Wednesday, put opposition to independence at 51 percent and support at 49 percent. That means neither side can feel confident, given the margin of error of about plus or minus three percentage points. Former Prime Minister Gordon Brown, himself a Scot, told a No campaign rally that the quiet majority of pro-Union Scots “will be silent no more,” while pro-independence leader Alex Salmond urged voters to seize a democratic opportunity 307 years in the making. But it is, both sides acknowledge, a once-in-a-generation — maybe once-in-a-lifetime — choice that could redraw the map of the United Kingdom. The gravity of the imminent decision was hitting home for many voters as political leaders made passionate, final pleas for their sides. More than 4.2 million people are registered to vote in the country of 5.3 million people. Cathy Chance, who works for Britain’s National Health Service in the Scottish capital, Edinburgh, said she would leave Scotland if it became independent. On the other side, Yes campaigner Roisin McLaren said she was finally letting herself believe independence might be possible. Politicians on both sides expressed confidence in the Scottish public, but uncertainty rippled below the surface. Opinion polls have failed to put either side decisively ahead. Bookmakers, however, told a different story. A winning 1 pound bet on Yes would pay out 5 pounds from many bookies, while the same pound would return just 1.20 pounds from a winning wager on No. One firm, Betfair, has already paid out on a No win. Brown, Britain’s former leader, told supporters that the patriotic choice was to remain within the U.K.
“The vote tomorrow is not about whether Scotland is a nation — we are, yesterday, today and tomorrow,” he said. “The vote tomorrow is whether you want to break and sever every link,” with the rest of the country. Despite gains in support for independence in recent weeks, Salmond said his side remained the underdog. 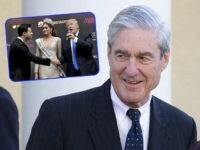 “However, as we know in life, in politics and certainly in this festival of democracy, underdogs have a habit of winning sometimes,” he said. Amid the uncertainty, even the opinionated Rupert Murdoch hedged his bets. The media mogul, whose newspapers were long considered a powerful force in British elections, traveled to Scotland last week and wrote a series of tweets that seemed supportive of independence. A Yes vote would trigger months of negotiations between Scotland and the British government over the messy details of independence, which Scottish authorities say will take effect on March 24, 2016, the anniversary of the date in 1707 that Scotland decided to unite with Britain. In Edinburgh, an unscientific but popular sweet-toothed survey has backed pollsters’ predictions that the result will be close. 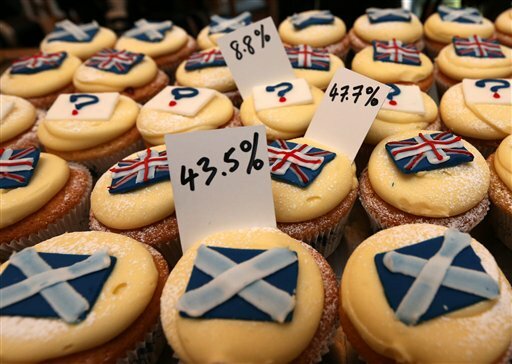 For 200 days, the city’s Cuckoo Bakery has sold referendum cupcakes — vanilla sponge with a center of raspberry jam, topped with white chocolate icing — in three versions, adorned with a Scottish Saltire, a British Union Jack or a question mark. On Wednesday, the bakery announced the result of its cupcake referendum: 47.7 percent No, 43.5 percent Yes, and 8.8 percent undecided. Co-owner Vidya Sarjoo said the number of undecideds had plummeted over time. “At first people really weren’t sure — a bit scared, maybe, to make their decision,” she said. Associated Press Writer Pan Pylas contributed to this report.